Please don't ask me for directions! Last year I experienced a Georgia Storm. 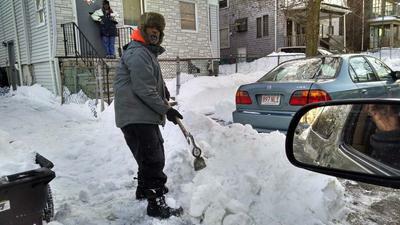 It was nothing compared to the last week's Juno my family in Boston, MA had to fight just to keep a pathway to the street from the house. 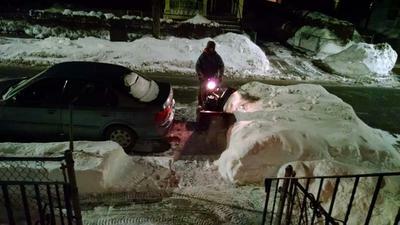 Under that block of ice and snow beside the gray car and beside the step on the right of the picture, is a driveway. 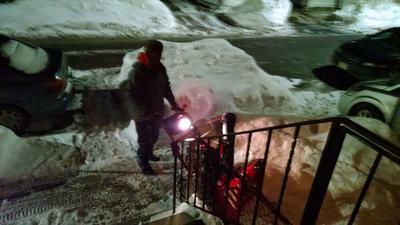 Snowblower and shovel weren't enough to remove newly added snow yesterday. 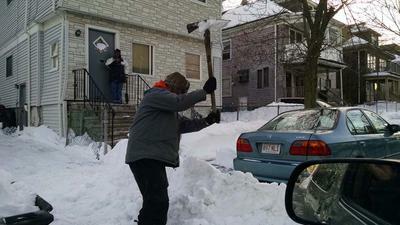 Wishing he'd gotten to the driveway after Juno last, Quinn Smith of Boston had to fight the elements by using a pick ax to get the job done. There's a blessing somewhere with this type of weather even with all the aches and pains of snow removal. I moved south when I wasn't able to recognize the blessing.